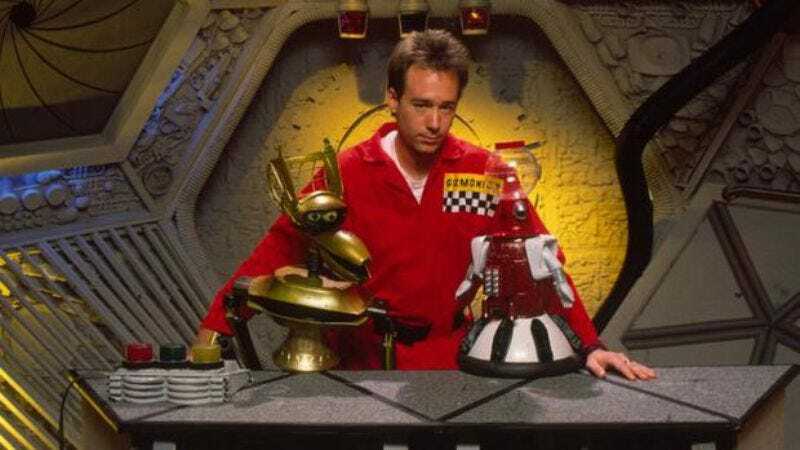 We’ve got telethon sign; with just four days left in his campaign to get Mystery Science Theater 3000 back on the (internet) air, creator and former satellite captive Joel Hodgson has announced a live broadcast to help push #BringBackMST3K over its $5.5 million fundraising goal. Featuring appearances from the show’s new cast (including host Jonah Ray and evil scientists Patton Oswalt and Felicia Day), and a bunch of other nerd-friendly celebrities and bands, the five-hour telethon will kick off at 8 p.m. Eastern on Friday, December 11, the final night of the revival project’s Kickstarter campaign. Currently clocking in at a little more than $4 million, Hodgson’s Kickstarter has already surpassed its initial goal to bring the show back in a limited, three-episode form. (In fact, it’s currently up to six new episodes of adorably wisecracking robots tearing their way through the bad movies of the world.) But the $5.5 million he’s now seeking would bump the new show up to a full season of 12 episodes, providing fans of the franchise with almost a full new day of puppet-based B-movie berating. The telethon isn’t the only promotional push Hodgson and his team are deploying this week, either; they’re also running a nightly double feature of classic MST3K experiments, complete with new introductions by Hodgson. The “Final Countdown” will kick off each night at 7 p.m. Eastern, with one Joel episode and one Mike episode being broadcast each evening, presumably to keep that long-simmering internet holy war from breaking out once again and destroying the whole campaign before it actually gets off the ground.